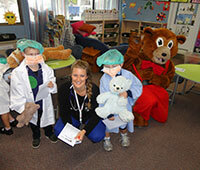 Monash Rural Health Mildura hosts a maximum of nine Year 4C students per semester. Students will spend blocks of six weeks in each of medicine of the mind, women’s health and children’s health, and during MoM and children’s health rotations will spend one day per week in a general practice. The second 18 weeks of the academic year are undertaken in rural hubs around Bendigo. Psychiatry Students undertaking medicine of the mind will spend their time at Mental Health Services, Mildura Base Hospital. This will include time in the 12 bed inpatient unit and also with community-based services ie CAT Team, Continuing Care, Aged Persons Mental Health, CYMHS (Child Youth Mental Health), and Headspace. This clinical experience will be complemented by up to four hours of lectures and tutorials per week. Visiting psychiatrist Dr Hieu Pham has a great reputation as a teacher, teaching the majority of the MoM curriculum. Students will also spend time on a daily basis with Clinical Director of the Mental Health Unit, Prof. Tom Callaly. You will also learn from fantastic inpatient and outpatient teams. Children's health Students undertaking Children’s Health will spend their time in the 10 bed paediatric ward and the six cot special care nursery at Mildura Base Hospital. They will participate in daily ward rounds and outpatient clinics under the guidance of consultant paediatricians. Other placements might include Mildura Special School, an Audiology service, and observe Speech and Occupational Therapy services for children. All students will participate in neonatal resuscitation sessions in the simulation laboratory and will additionally spend further time in the laboratory practicing paediatric related clinical skills. Students undertaking women’s health will spend their time in birth suite, theatres, outpatient clinics with both public and private practitioners, ante-natal and post-natal clinics and will undertake a mentor week with a designated consultant obstetrician/gynaecologist. Students will also have the opportunity to participate in outreach clinics to Dareton, NSW and Robinvale. two hours of didactic lectures are provided each week by a variety of registrars and consultants. Students will also participate in up to 15 hours of skills-based sessions in the simulation laboratory, as well as participating in the PROMPT (PRactical Obstetric Multi Professional Training) simulations. General practice Learn from enthusiastic teachers with a reputation for providing good clinical experiences. 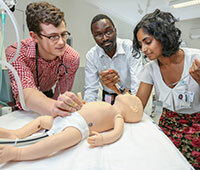 Monash Rural Health Mildura conducts mock OSCEs at the end of each semester to help prepare all students for their exams.